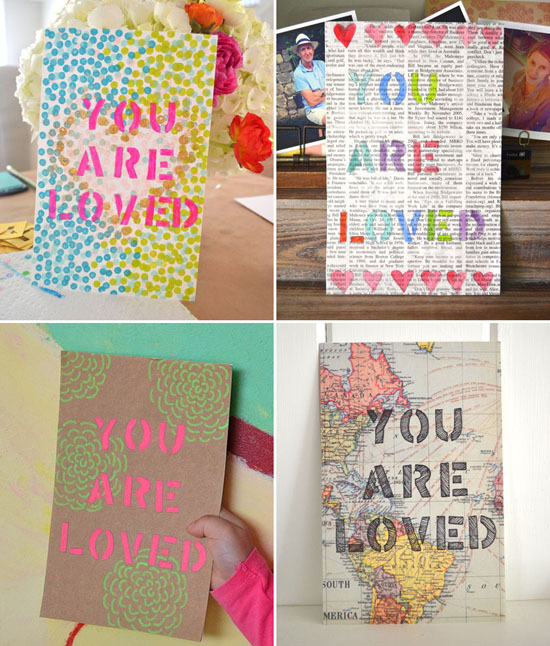 Recently, the kids and I made some “You Are Loved” art. We gave three away to our wonderful grandmas for Mother’s Day, and then kept making more and more because there is always an occasion to tell someone they are loved! 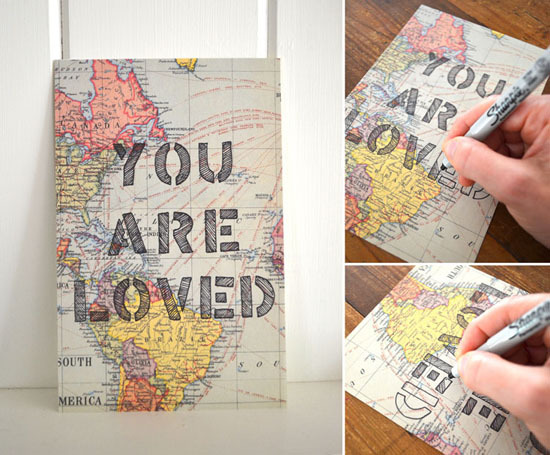 It’s an easy and fun little project that can be as simple or intricate as you wish. We tried four different mediums: Stamps, markers, paint and pens. Which do you like best? There are four steps to these stamped cards. 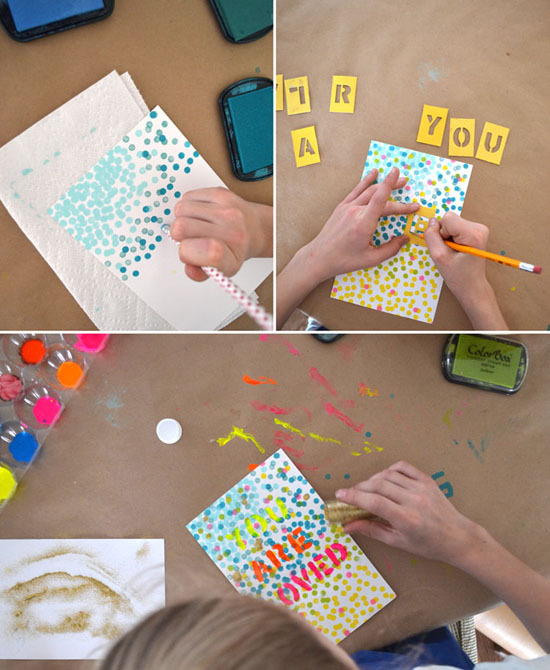 Step one: Chose some colors and cover your paper with dots. Sometimes we drew a heart first. 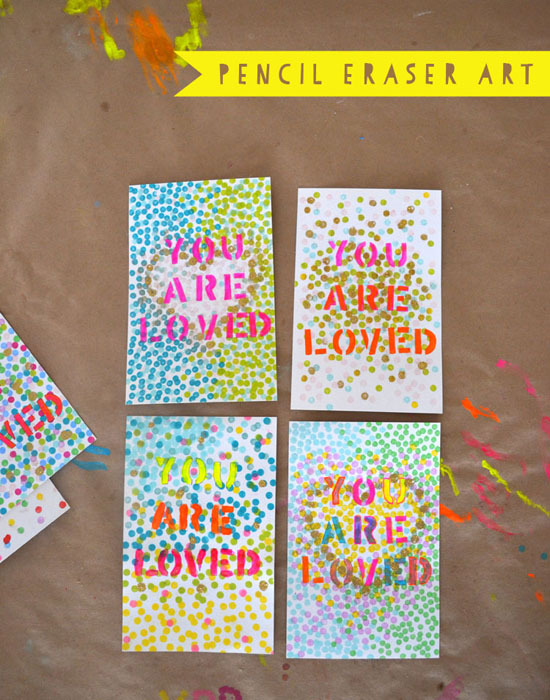 Step two: Lay down your stencils and trace with a pencil. Don’t worry about being too perfect. As I always tell my kids…beauty lies in imperfection. Step three: Paint in your letters. Step four: Use some Elmer’s glue and your pencil eraser to randomly place some glue dots around your art. Then, sprinkle some glitter and shake off. Now your masterpiece is ready! 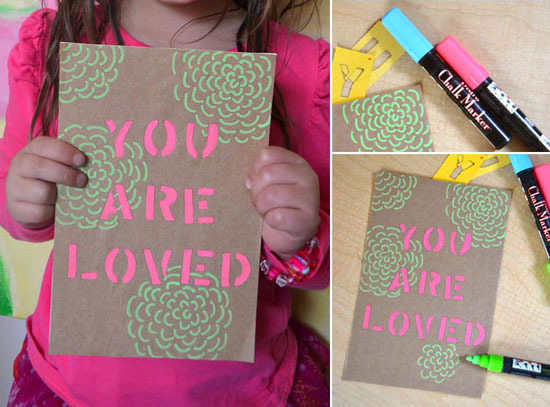 Markers: For this one we used kraft paper and some very cool chalk markers. You can leave it plain, or decorate by hand. Dots would be awesome, too! 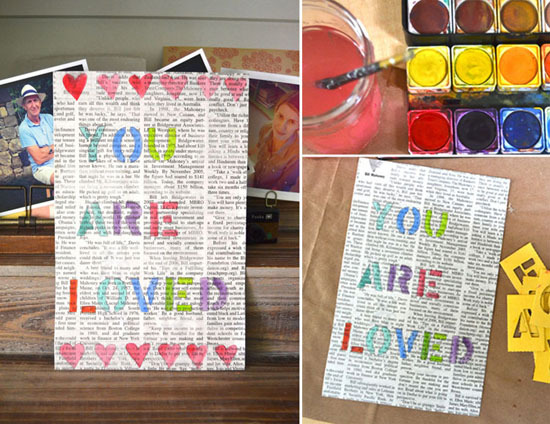 Paint: I have a bit of a fascination with the newspaper/watercolor combo, so this one is a favorite. We erased some of the newspaper ink here and there to make it feel worn + loved. Pen: Speaking of vintage, I love the way this one turned out on the vintage map paper. It’s so simple, yet manages to create a bigger message. We could make these forever and ever! Father’s day is right around the corner so guess who’s getting one next?